Camera video surveillance with Xeoma is easy, easier and faster than handling a coffee machine, even if you haven’t yet had any such experience. Our informative resources will guide you if you have questions. If you have questions about Xeoma, please see this article. One of the questions you might have when planning camera video surveillance is what camera to choose and how to use it once it’s chosen. The answer depends on your video surveillance goals, circumstances in which it will be used and budget. 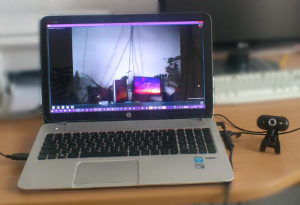 The easiest way to create camera video surveillance is to use a laptop’s embedded camera or a web cam (also known as a USB camera) with a wire, like those used for skype calls. Plug such a wired camera in a USB port. Launch video surveillance software Xeoma on this computer, laptop or tablet. Cameras of this type will be detected automatically. -only works for short distances (up to 3, max. 5 m) from computer/laptop. Wired cameras of this type usually have 0 to 1.2 m cable. Cable extension can be used to achieve longer distances but every such hub results in signal attenuation, and signal amplifiers should be used. As the result, price of such installation increases to the extent where it’s cheaper to buy IP cameras. Network cameras (also known as IP cameras) are slightly more complicated as ones requiring actual mounting and setup, yet they offer higher quality and advanced options. IP cameras are said to be the future of camera video surveillance and are recommended when web cameras don’t fit to your needs for some reason. IP cameras are mounted onto ceiling (the so called dome cameras) or to a wall with the bundled mounting details. Older outdated models of this type of cameras used to get power from power adapters and thus needed access to power outlet nearby. Up-to-date models of network cameras are powered through Ethernet cable to router or computer (PoE technology). 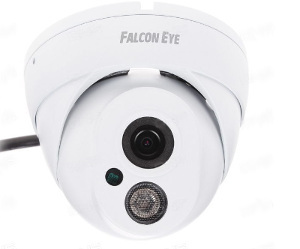 Example of affordable cameras in this category is Falcon Eye FE-IPC-DL100P. 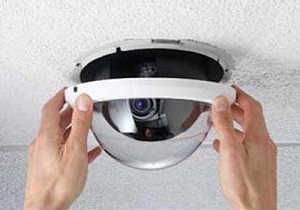 Indoor camera video surveillance seems to be just about mounting and connecting cameras while for outdoor camera video surveillance you need to consider other factors like weather and wide territory challenges. So if you need outdoor video surveillance – for example, parking lot video surveillance – mount a camera in the right place and connect it with an Ethernet cable to a computer or, if there are several cameras, to a router first, and router to a computer. Wireless connection (also called WiFi) is also possible, however this type of connection might be unstable due to interferences or usually lower network bandwidth. The router or computer need access to power outlet. Router is connected to computer also with an Ethernet cable or coaxial cable. When all is ready, you will be able to view the camera(s) in the same local network. Follow instructions in the camera’s user guide for initial setup. When camera is set up, launch Xeoma on this computer you have access to cameras from. Tip: Look for ONVIF support in camera specification, it will increase chances that the camera will be detected in Xeoma automatically. Avoid “No name” cameras that claim to use their own cloud, P2P or ActiveX because they tend to be troublesome in work with third-party software. You’d better opt for cameras from time-proven manufacturers like HikVision. -can have advanced features like PTZ (pan, tilt, zoom), etc. Night video surveillance. There are 2 options if required is camera video surveillance in the night: use cameras with infrared (IR) night vision capacity, or turn to artificial illumination with help of IR illuminators, the latter being a quite more pricey option. Please note that embedded IR night vision of IP cameras usually have 15 to 30 meters’ range (for example, quite popular Hikvision DS-2CD2032F-I camera), so make sure that the monitored object is within this range. IP cameras usually have greater image resolution resulting in wider scenery coverage. Viewing angle is normally up to 90 degrees vertical and up to 120 degrees horizontal. The so called Fisheye IP cameras and wide range IP cameras (WDR) have bigger viewing angle – up to 180 or even 360 degrees – so one camera of such type can replace several ordinary camera. Xeoma has the special “Fisheye Dewarping” module to get the image from such cameras in a normal, rectangular form. Best viewing angle of a camera depends on your video surveillance goals: wide angle is best to cover more room while short angle is meant for face recognition. Outdoor video surveillance. The so called outdoor IP cameras have special casing better fit for outdoor video surveillance and anything it implies – changes in weather, wind, humidity (example of such cameras is Partizan IPO-1SP). To fight against human tampering, special vandal-proof modifications with even stronger casing can be used, or think strategically and place cameras out of reach of possible criminals. Wireless video surveillance is seemingly a great way out for when you don’t feel like trenching cables from cameras to router. Xeoma supports both wireless/Wi-Fi and wired cameras, for example the Partizan IPB 2MP camera. However, this type of connection is deemed unstable when a lot of cameras are used due to bandwidth capacity issues, or due to interferences. If such issues occur, an important event might go missing. If stability is a must in your video surveillance, better use wired type of connection. Automated tracking: PTZ cameras are famous for their capacity to “move”: follow the moving object in the camera’s field of view or do a “guard tour” across the monitored area. Such camera can move automatically (for example, when movement is detected), or you can click the controls to make the camera move manually. Xeoma supports both – the former with the “PTZ Tracking” modules and the latter with the PTZ control shown as the camera is connected to Xeoma, for example, the Falcon EYE MTR300 camera.